Download "M-Learning System Implementation and Features"
2 64 Jaromír Hrad, Tomáš Zeman and Marek Nevosad MLARG Project Our department has been involved in research and practical application of innovative pedagogical methods for many years, and therefore we eagerly accepted the offer to participate in a European lifelong learning / Leonardo da Vinci project M- Learning for the Young People (Students) at Risk Groups (MLARG), coordinated by Boğaziçi University (Istanbul, Turkey), with partners in Italy, Slovakia and Czech Republic. The aim of the project is to use mobile learning technologies to design language (English) teaching materials and methodology for young people (ages 16 17) with limited financial resources studying at vocational high schools. The main reasons for choosing mobile learning are the following: m-learning helps learners to develop positive attitudes towards literacy both in school subjects and technology, m-learning motivates learners to take part in activities in mobile medium of communication via multimedia tools, such as, mediaboard, portal page, and clips, m-learning allows anywhere, anytime and personalized learning for everyone, with just very basic equipment. During the implementation period of the project ( ), the pilot trainees got access to m-learning facilities; it is considered that using m-learning at anytime and anyplace should give young people at risk groups a strong feeling of being taken care of, valued, and included in the society. M-learning should also allow them to personalize their way of learning and increase their self-esteem and self-confidence. There is a need to adapt mobile devices to education and enhance learning environments. In the project, these remarks are outlined by taking into consideration the needs of young people/students at risk groups. Different mobile platforms were tested with respect to their specific features in order to find the particular device type that would accommodate the given needs and could be used for pilot testing with a sample group of students. Such a device must be relatively inexpensive (i.e. affordable to the target group), but it should offer Internet browsing capabilities, as described above. Another goal was to identify the elements of the educational content that might be used for mobile learning without any technological or economical limitations (for example, we have to take into consideration the size and resolution of a display, but also the limited data throughput achievable with specific mobile data technologies, or the total volume of data that can be transmitted by a specific mobile user with a specific tariff plan within a given period of time). From a pedagogical and didactical viewpoint, the inclusion of mobile technologies is a new feature. Therefore it is necessary to design the technical implementation together with suitable procedures and methods that would make use of specific properties of such solution; on the other hand, any procedures in which the use of mobile terminals would bring more difficulties than benefits (compared to traditional e-learning) should be limited or even eliminated. 4 66 Jaromír Hrad, Tomáš Zeman and Marek Nevosad preserve (to the largest possible extent) the option to study the learning content in the same GUI that is used on standard computers. It is vital for the success of m-learning implementation to provide the users of the courses with a comfortable and friendly GUI. The original Moodle system is not suitable for devices with small displays. Therefore, we have decided to use the MLE (Mobile Learning Engine) plug-in, which helps to optimize the learning content for presentation on mobile devices, organizing it into the format of relatively narrow columns. As the recent version of MLE did not meet all requirements given by the nature of the considered courses with respect to the proper presentation of their content, we have started adequate modifications of the MLE source code, so that it becomes more compatible with project objectives. 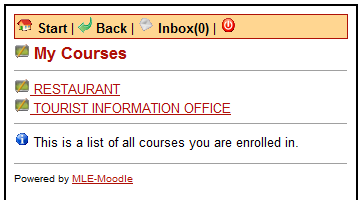 In some details it was necessary to modify Moodle itself. The implementation of the mobile solution is based on key project objectives: a) Motivation of students to learn through presentation of the learning content in an attractive form; b) The given topic, i.e. English language for professional schools in tourist industry. Pilot Course We have prepared an operable version of six exemplary courses. They are relatively short and their main purpose is to verify specific functions of MLE-Moodle as well as the m-learning methodology. The courses can be accessed at (version optimized for mobile terminals) or (PC-compatible version for reference purposes). The following topics of the courses are currently available: Restaurant, Tourist information office, Check-in, At the travel agency, Destinations, On the tour. The target group involved in the pilot testing is composed of students at secondary schools specialized in tourist industry, and the particular objective is learning of English language with emphasis on specific situations and the corresponding vocabulary. Platform-related Issues As for the communication among students (and their teachers), usual tools common for Moodle system (chat, discussion forums, and direct messages) are available. 6 68 Jaromír Hrad, Tomáš Zeman and Marek Nevosad The overview of specific types of exercises can be seen in Figure 2. 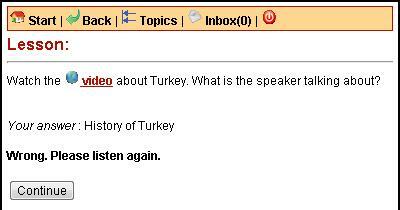 The type Listening for gist consists of listening to an audio file, after which the students pass a simple test (e.g. single-choice out of three options) verifying whether they have understood the meaning of the message. The Listening for specific information is a similar type of exercise, verifying whether the listeners understand also particular details of the message. In these tests students are usually given two attempts, and if both answers are wrong, then the correct response is eventually displayed. Figure 2. List of exercises (various types) The exercises of Reading for gist type focus on the understanding of written texts. The question is in the textual form, and students are offered only one attempt to answer. Reading for specific information, similarly, focuses on searching of specific information in a text. Individual questions are displayed successively, and a wrong answer cannot be corrected. The total numbers of correct and wrong answers are summarized at the end. 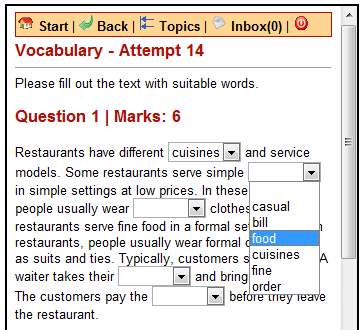 The Vocabulary exercises (see Figure 3) are, as we could expect, intended to practice the vocabulary. The individual tasks involve completing sentences (choosing one option from a limited offer of expressions) and assigning corresponding words to pictures. 7 Subsystem for M/E-learning and Virtual Training based on IMS NGN Architecture 69 Figure 3. Specific type of exercise ( Vocabulary ) One of the major problems is displaying and viewing of large images. As the display area is limited, there are basically two solutions coming into consideration: Displaying of the entire image in a reduced size (which introduces the risk of poor readability because of the small dimensions), or Viewing by parts, changing the displayed area with the help of horizontal and vertical scrollbars (which might be difficult to get oriented in). MLE-Moodle uses the latter option (scrollbars), as illustrated in Figure 4. The picture is displayed in its original size, but users have to move over it. However, modern devices with multi-touch screens make resizing and moving very easy. The last frequently used type of exercise is Language use practicing of understanding the language. Different types of questions are available for testing. 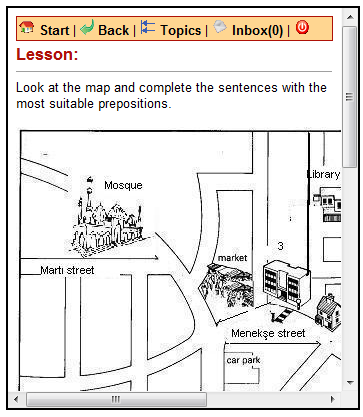 This type of exercise is included at the end of every module or lesson. 8 70 Jaromír Hrad, Tomáš Zeman and Marek Nevosad Figure 4. Displaying of a large picture The developed learning content includes also videos (see Figure 5). 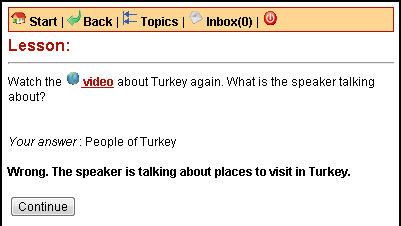 A specially prepared video server was implemented within the system. Video sequences are uploaded to the sever and then automatically converted to a format suitable for mobile devices (we have chosen MPEG-4). With respect to the limitations of other supporting technologies (such as Adobe Flash) we have decided to use displaying through HTML5 standard; however, this solution introduces a demand for an advanced web browser installed in a mobile terminal. Video can be played back directly from the displayed web page, but often there is implemented a proprietary solution for video playback in a mobile device. When a request for video playback is indicated, the integrated playback method is used (e.g. pre-installed Real Player). In this sense we can encounter similar problems as with playback of external audio files. Also, incompatibility of (usually user-installed) web browsers and integrated media players (for audio and/or video content) may occur. 9 Subsystem for M/E-learning and Virtual Training based on IMS NGN Architecture 71 Figure 5. Video playback Two different types of learning activities were the most frequent ones in the course of MLARG learning content development Lesson and Quiz. It was necessary to choose the type of an activity also with respect to the required feedback (Figurea 6-7). 11 Subsystem for M/E-learning and Virtual Training based on IMS NGN Architecture 73 use the individual learning objects on a regular basis (if any, to what extent) is crucial for the future employment of this technology in regular education. We can envisage that the m-learning technologies will become useful mainly in those areas where the learning content can be presented in a visually simplified form (with emphasis on reduced volume of textual information). Typical examples of applications include various drill learning methods (vocabulary, phrases, filling of correct words to sentences, applications supported by instructions spoken from a mobile device, single-choice from several options, etc.). On the other hand, we expect lower interest in m-learning applications that require reading of many texts, filling of numerous forms or frequent movements on the screen of a mobile terminal device, such as solving of complicated tasks, assignments requiring schemes, diagrams, graphs or videos, tasks for which the users need to compile context-based information from different resources. References O Malley, C., Vavoula, G., Glew, J. P., Taylor, J., Sharples, M., Lefrere, P., Lonsdale, P., Naismith, L. & Waycott, J. (2005). 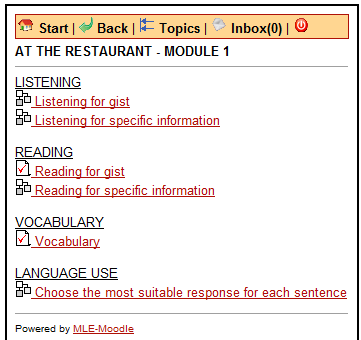 Guidelines for Learning/Teaching/Tutoring in a Mobile Environment, MOBIlearn Project Report. Vaněček, D. (2006). Progressive Education Methods. New trends in engineering pedagogy. Workshop of the International Society of Engineering Education IGIP. Praha. ČVUT. ISBN Web portal of MLARG project [online]: Acknowledgment This article has originated thanks to the grant support obtained from the EC within Leonardo da Vinci project No TR1-LEO M-Learning for the Young People (Students) at Risk Groups (MLARG). ViSH User Manual. ViSH is a social network for teachers and scientist to meet and collaborate in the science teaching. The Hepldesk and the CLIQ staff can offer further specific advice regarding course design upon request. computer aided training solutions, tailored solutions to organizations 1.1. e-learning DamaSistem SCORM IMS, DamaSistem Ltd.
Members of staff may also phone for assistance at any time during the college day (extension 3277). E-LEARNING SYSTEMS A WAY TO MAINTAIN COMPETENCE?